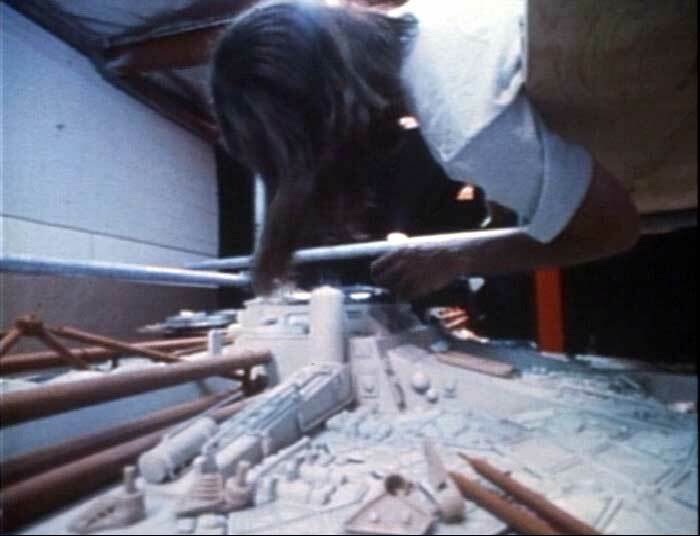 The 26' long miniature was constructed from metal, wood, plastic, 850 Japanese model kits of German tanks, and thousands of custom resin-cast parts. Construction took over eight months and involved over thirty people. 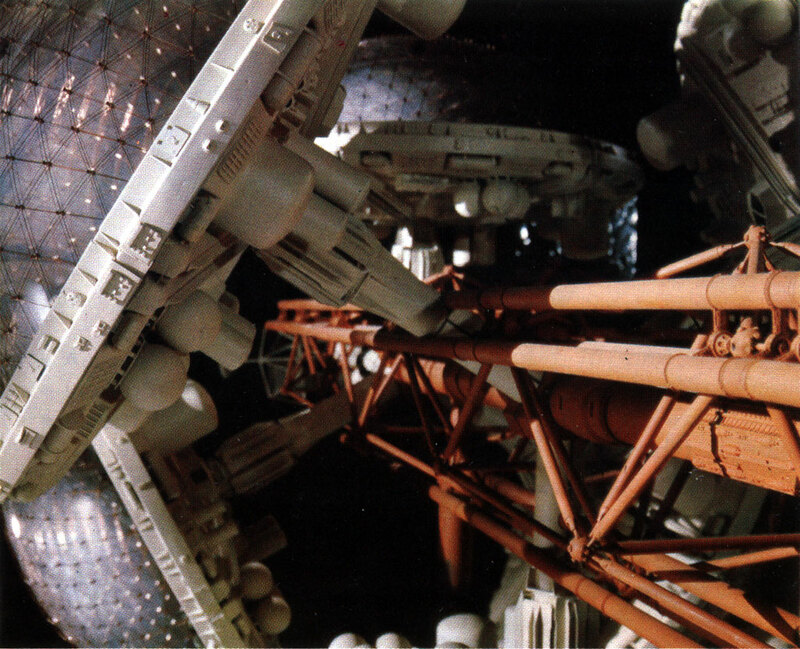 The superstructure and fuel pods was inspired by the 1970 Osaka World's Fair Expo Tower. 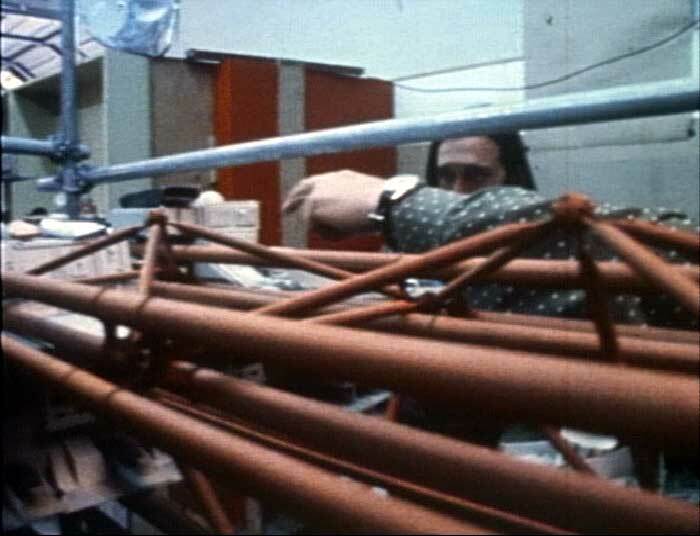 2 ½" steel pipe was bolted together for the ship's basic armature. 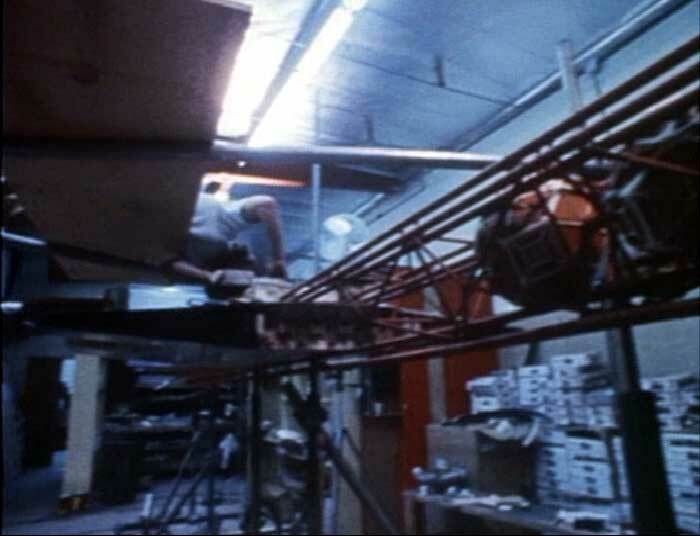 It was constructed in three sections on a rolling platform, that became too unwieldy and delicate to move. 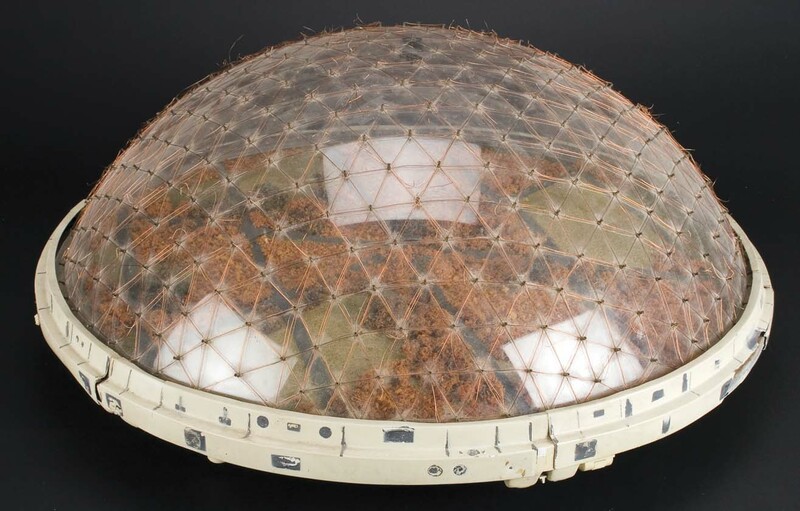 The two foot blow-molded acrylic domes were hand drilled and laced with three layers of copper wire (at sixty hours per dome). 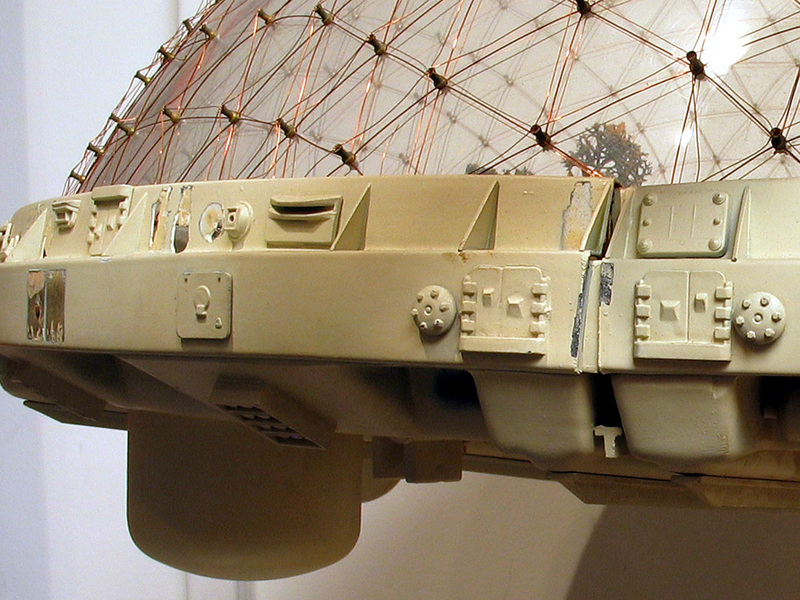 Parts were attached to the model using a new glue that unfortunately aged and delimitated over a short time. 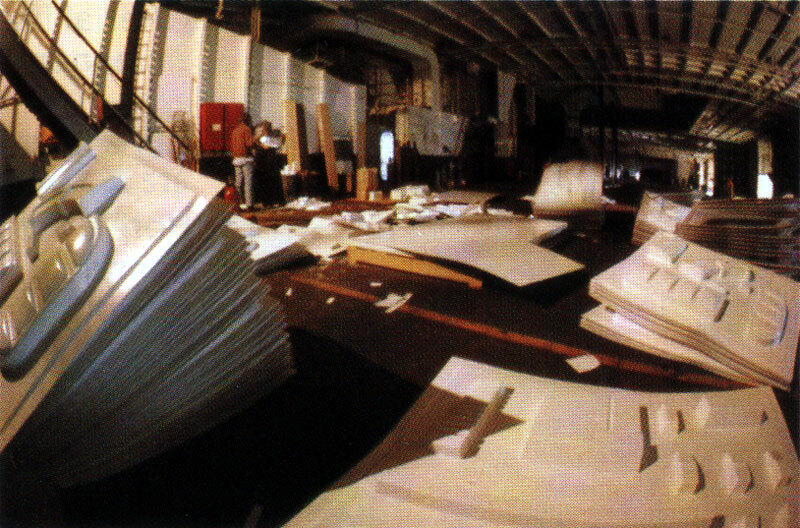 Numerous parts fell off during shooting. 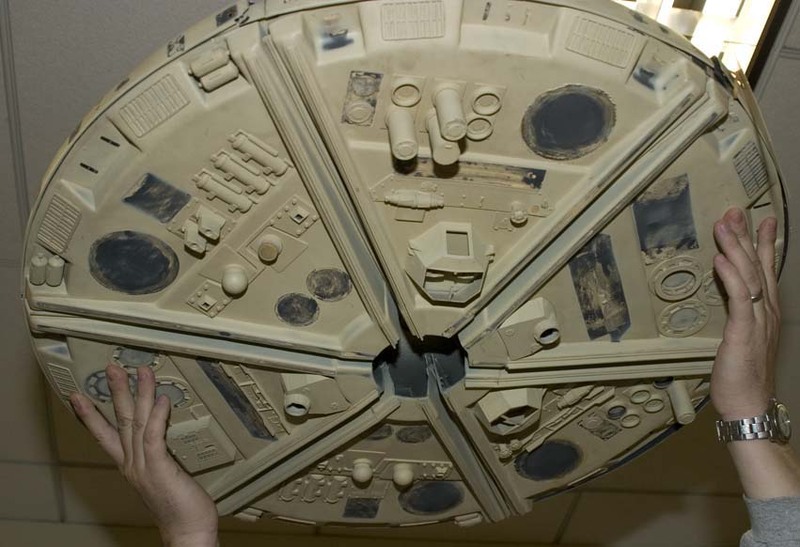 The model took six months to build and was disassembled, after shooting, in about an hour and a half. The model was photographed using a Scotchlite front-screen backdrop. 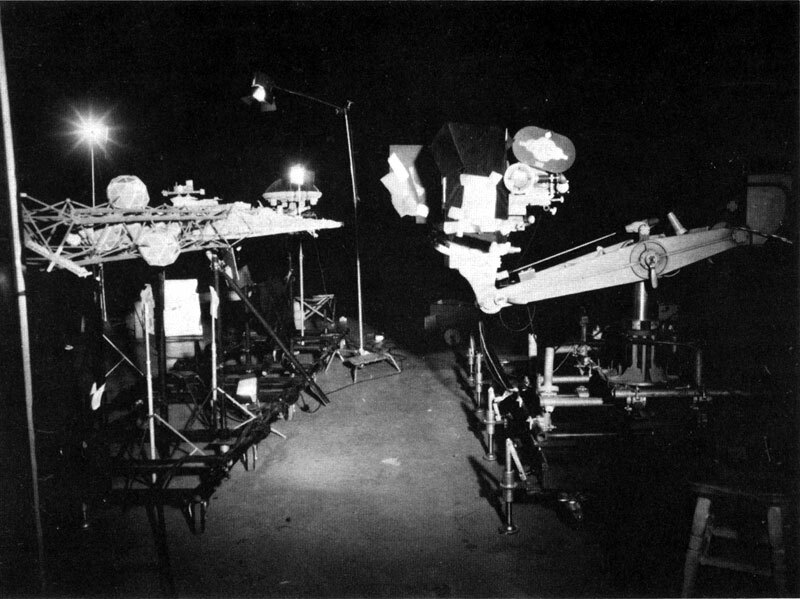 The starfields, ships, and saturn was projected on the backdrop during filming, saving compositing time and $$. A number of photography tricks were used to compensate for the model's focal depth of field. 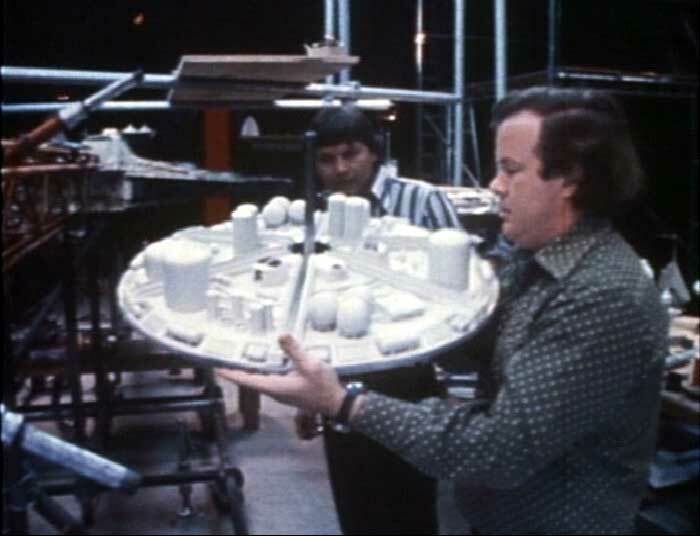 Most of the model fell apart over the years and very little is left of it today. 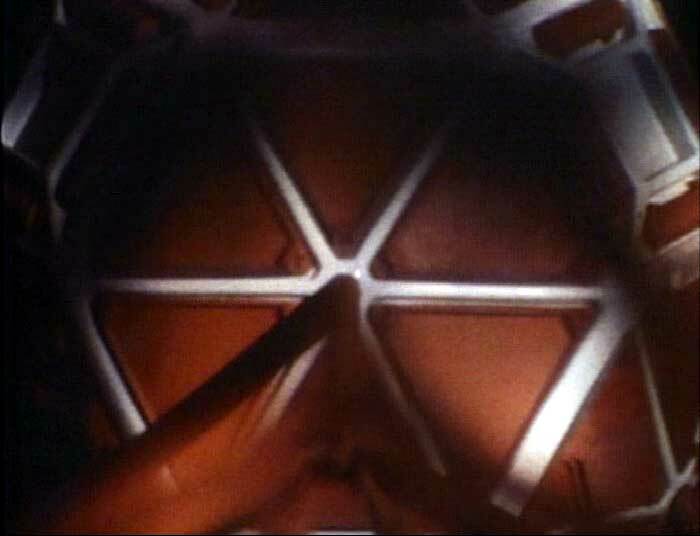 Bill George was gifted one of the geodesic fuel pods by Greg Jein. Do you know of any other parts of the Valley Forge have survived over the years? Email me if you have any information to add on this subject. 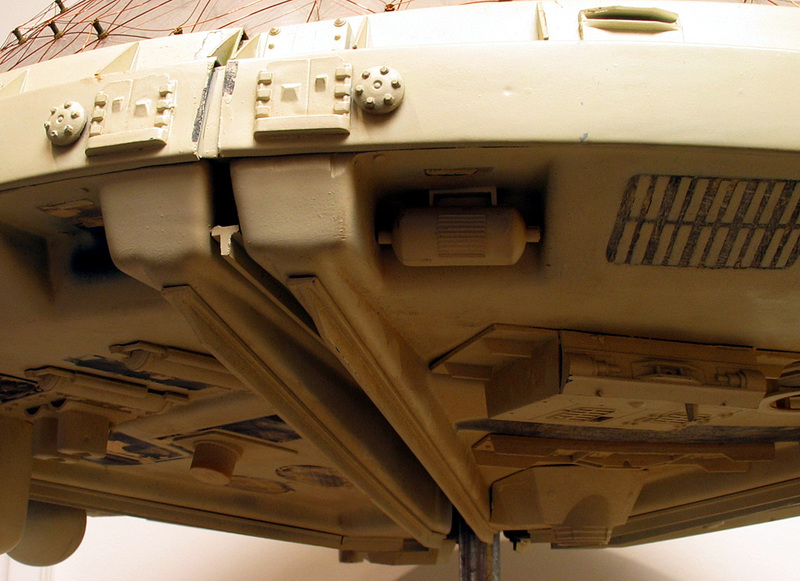 *The Valley Forge appeared (thanks to stock footage) as an "agro-ship" in the short-lived Battlestar Galactica. 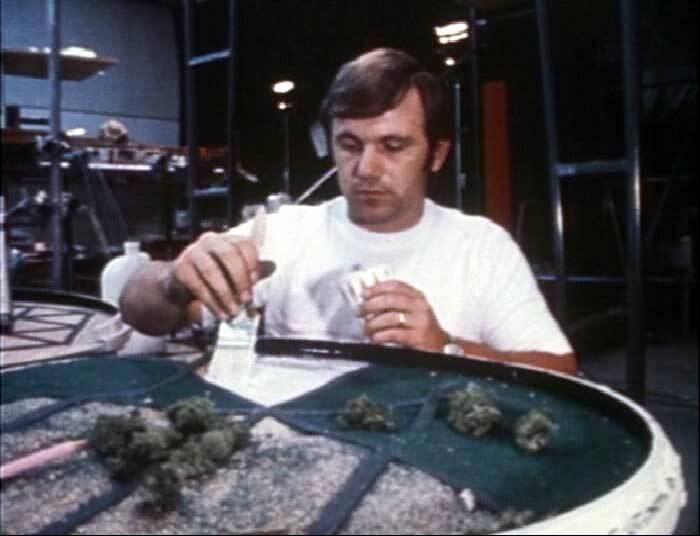 John Dykstra worked on both projects. 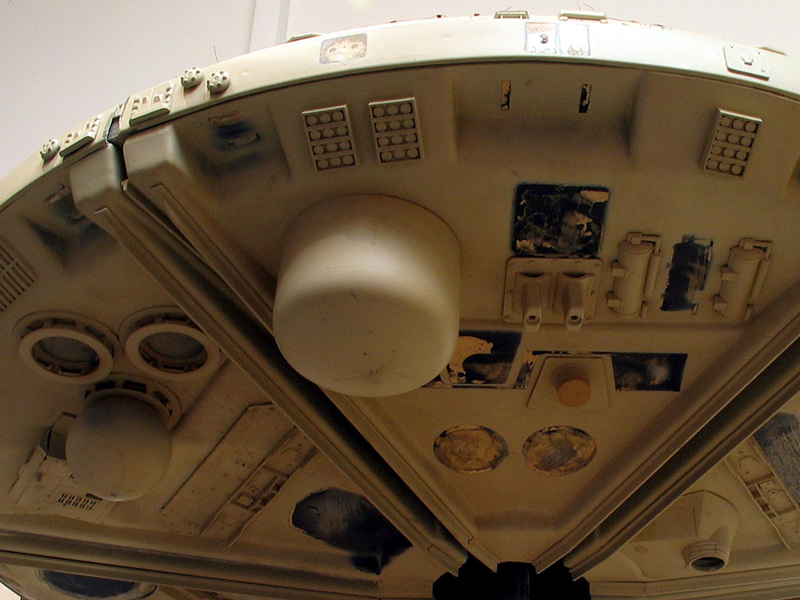 This is one of the Valley Forge's fuel pods (that is what I call them). 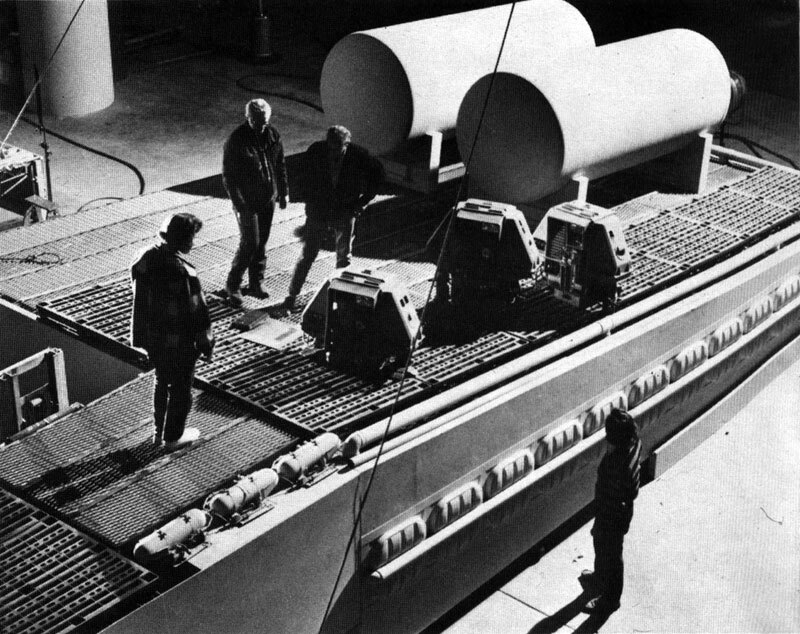 I received these photos from Bill George, who used to work for Greg Jein. 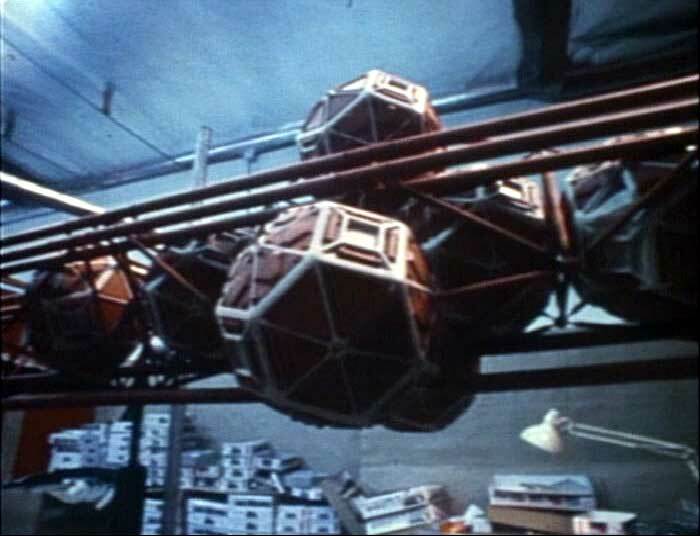 Greg gifted him with an Agro dome and one of these modules. Sadly, he returned the dome, during a move, back in '81. Luckily he held on to this. 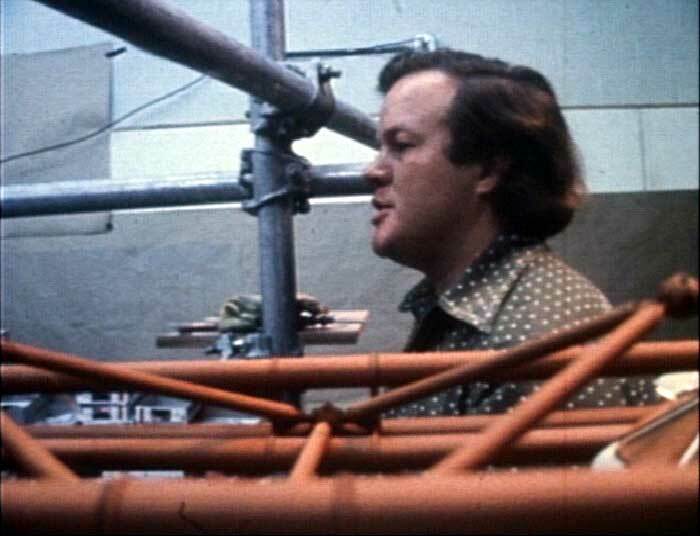 He mentions that the colors seem to be "off", compared to the images from the film. Bill was nice enough to include a ruler in the photos. 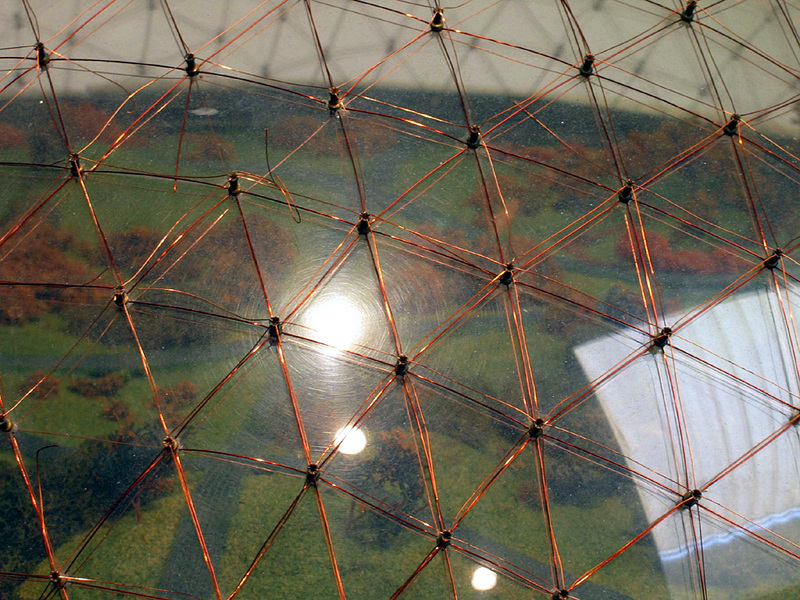 A second dome surfaced in December of 2007. 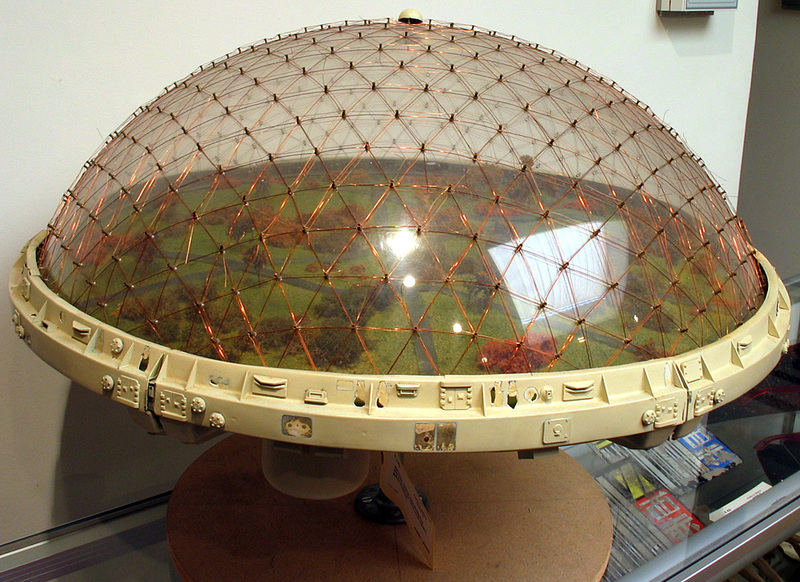 This dome was listed on ebay, as an "Agridome used in Battlestar Galactica ". It's starting bid was $3,000. I do not know what I finally when for, or who takes care of it now. 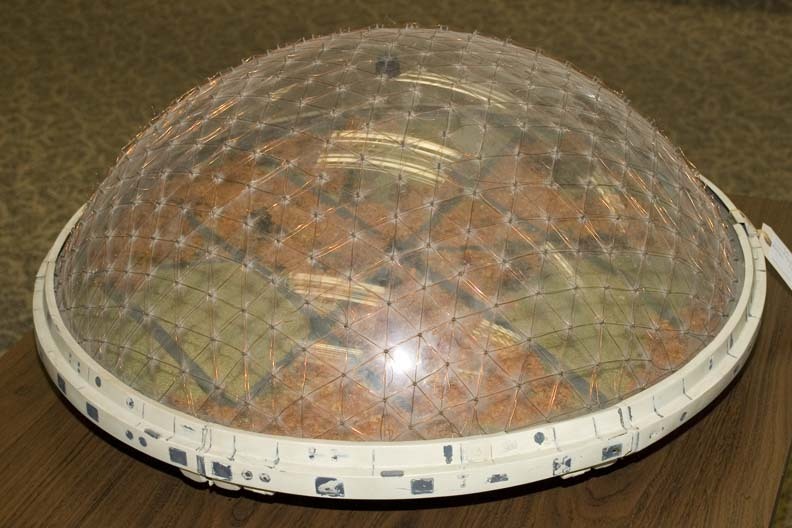 The dome was not as complete as the one from 2003. 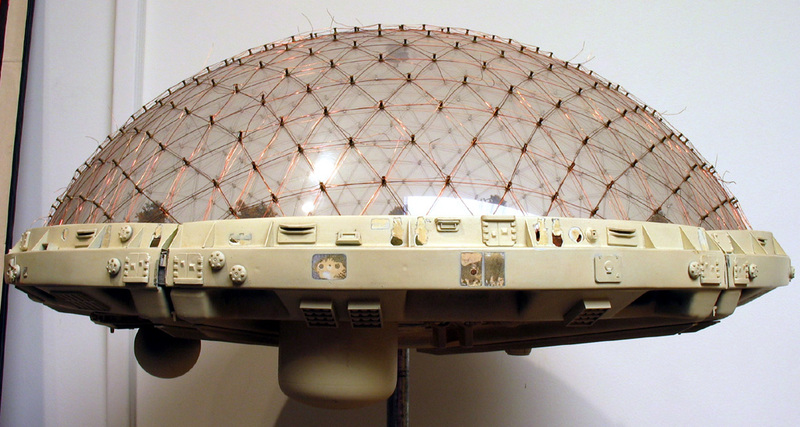 One of the surviving domes is on display at the Science Fiction Museum and Hall of Fame in Seattle Washinton. 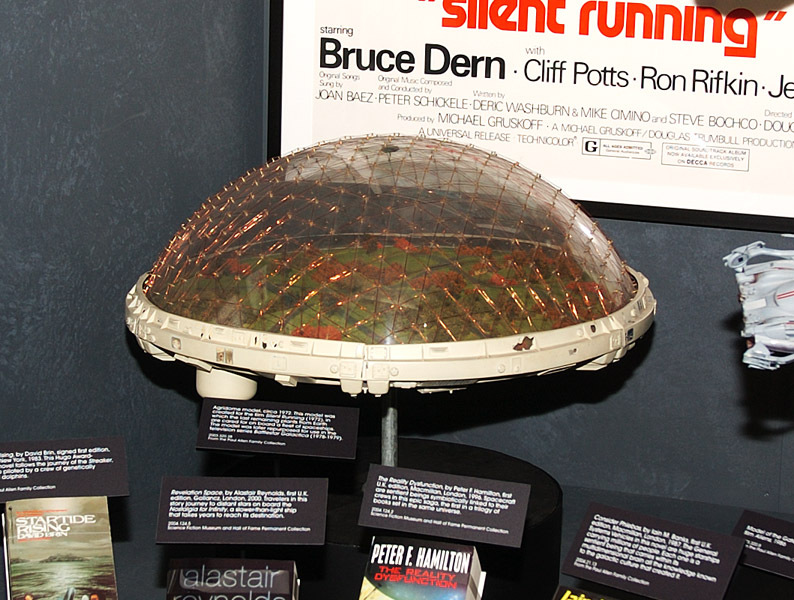 This dome was purchased for $11,000 at action in the summer of 2003 and now resides in a gallery, in front of the film's movie poster. The paint has yellowed and a number of pieces were either missing or have been reattached in new positions. 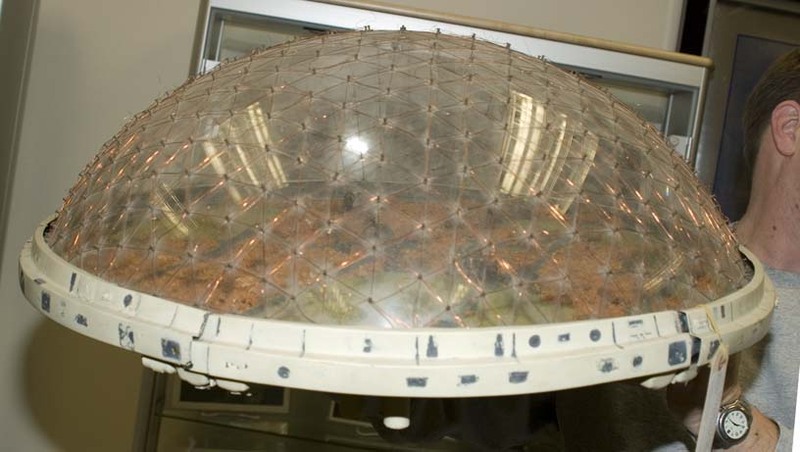 Some of the copper wiring net over the dome is broken. 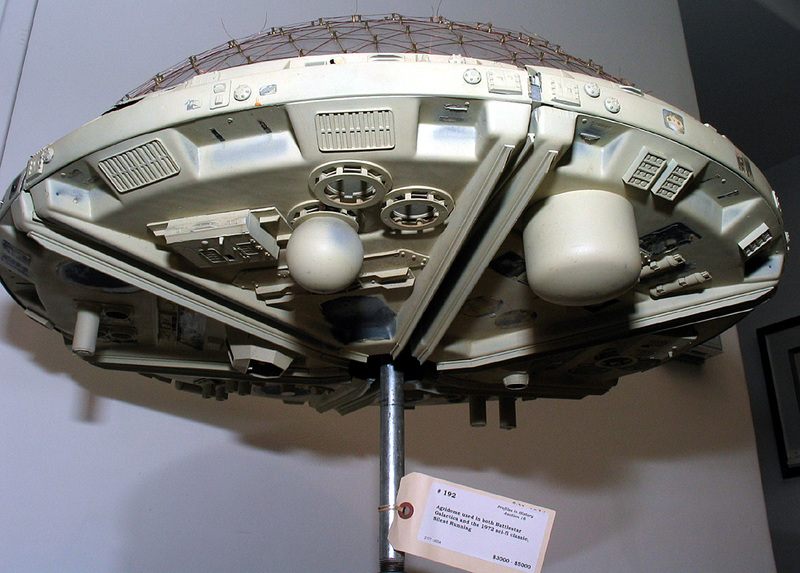 Considering that the prop was over 30 years old, it is in pretty good condition.